This wig features an elastic band for a comfortable and secure fit to almost any head size and is available in a wide selection of colors. Perfect for historical plays, school projects, and colonial period masquerade parties and weddings. 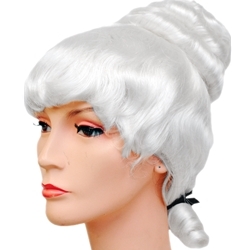 The wig is a colonial style powdered lady wig with a tall upswept top and a curly pony tail.